General Description: The Pinto Basin is a small to medium sized point, ranging in blade shape from triangular to lanceolate. Its most distinguishing feature is a short, concave or bifurcated stem which may be straight, contracting or expanding slightly. There are two major varieties of the Pinto Basin primarily dealing with the variation in the haft configuration: Pinto Square Shoulder and Pinto Sloping Shoulder. There appears to be a great variability of the types in the Pinto Basin series of points and more study and refinement of the type is needed. There are variations in notching angles which effect the shoulders. In addition, the blade edges exhibit variants such as serrations vs. non-serrated as well as excurvate to straight blade edges. The Pinto haft section, exhibits wide and shallow side notching indentations on the side and notching of the base. The shape of the basal ears includes rounded to squared variations. The apparent preforms of the type were of several shapes varying between narrow ovate and trianguloid. Producing the basal notch typically involved the removal of several flakes from each face, leaving a rounded notch termination. The flaking pattern of the blade is typically random but chevron flaking of one or both sides of the blade is not uncommon. Pressure flakes were detached to create thin serrated edges and the follow the established contour of the blade surface with feathered terminations. The Pinto Basin point is found in the Great Basin area of Nevada, southern Oregon, western Utah, eastern California, southeastern Idaho and along the Pacific Coast. The age of the type has been identified as being between 6000 to 2000 BC. 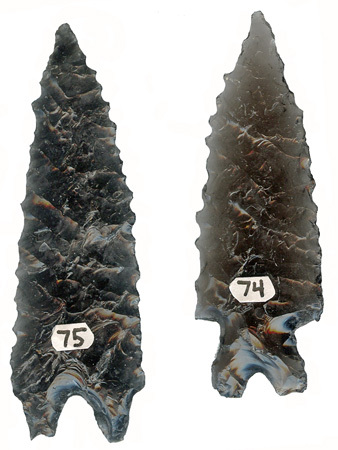 The principal material used in the manufacture of the type was obsidian. The Pinto Basin point type was named and defined by Charles Avery Amsden in a report by E.W.C. Campbell and W.H. Campbell published in 1935 for specimens found in the Pinto Basin site.